Earlier this week while on a phone call with a potential client, I was reeling through all of our exclusive package inclusions as I normally do, when I was caught off guard by a familiar yet faintly asked question: "Wait, what is the online planning whatever you called it thing?” Not that this particular type of question never gets asked, but when it’s asked over the phone instead of in a face-to-face meeting where I’m able to physically walk clients through it, I found myself stumbling over words and trying to not be repetitive with the all too common phrases I often use to describe our planning portal. If you’ve booked with me in the past then you know the ones— user friendly, easy to navigate, and so on. Or you’ve at least heard me rephrase and reuse some of my personal favorite descriptions like, "It’s an exclusive page setup for you to select music, enter in bridal party information, connect with your DJ, make payments, and really so much more!” But saying those phrases and sentences over the phone can potentially create a whole new level of confusion and complication, especially for those that are not as trained in tech talk as others of us. Long story short, after fumbling over a few words and possibly making this incredibly kind prospective client of mine a little bit more confused than before we started talking, I ended up taking some screenshots, sending over detailed instructions, and then naturally started writing up the idea behind this blog. And here we are. Below I’m going to answer a few FAQ regarding our online planning portal as well as show you how great this handy tool of ours is through the use of screenshots and detailed descriptions. I’m also going to cover why we use it and why it’s important that our clients utilize it as well. So without further introduction, here’s my why and how-to guide for our Online Planning Portal..! :: Where do I login? Once we receive your signed contract and process your deposit, you will receive an email from me that includes your username and password, as well as a direct link to the client login. Once you're directed to that site, you will simply type in your provided username + password, and the first screen to appear will be our welcome page which includes your event details, tips on how to navigate the portal, and multiple action tabs such as 'Plan My Event' and . Click around, there's nothing you can hurt! Can I change my password after logging in? Yes, after you login for the first time you will automatically be prompted to change your password. If you set your new password and can't remember it, you can always reach out to me in the office and I can send you a copy of your password. However, I will only give the correct username and password to the client(s) that is (are) booked. For starters, it's always good just to scan through all of the event information and contact information that we have for you on our end. 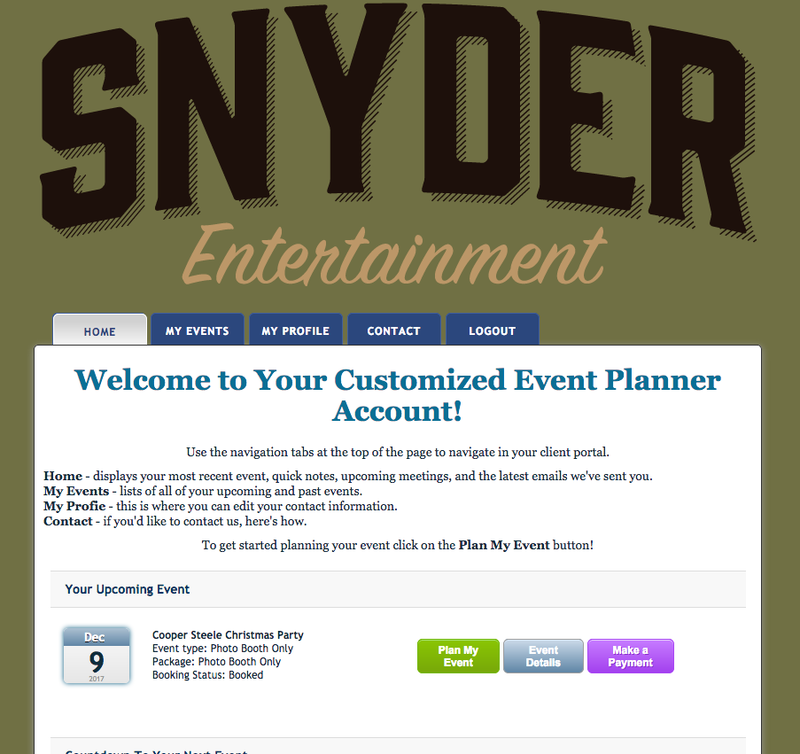 You can manage that information and see those details through the 'Event Details' tab on your welcome page. From there, it's up to you! You can start selecting music, entering in any vendor information that you have, bridal party information, and so on. As I mentioned before, feel free to click on every button and browsing through our music library; there's nothing you can do wrong! Yes! You can easily make as many payments as you'd like leading up to your event using the 'Make a Payment' tab also located on the welcome page! We use PayPal and all of the processing and receipts are backed up through a secure server. What if I want to request a song that isn’t listed in the music library? If you can't find a song that you have to include on your special day in our huge music library, that's no problem! Just send us the song title and artist, as well as any other important information, and we'll purchase the song at no additional charge to you! Do I need to fill out all of the forms? We really encourage you to do fill out as much information as you can! This is not only helpful for your assigned DJ, Emcee but it can also serve as a great time to craft your day-of timeline and make note of any important details that you don't want to forget. You will review all of the information on the forms with your assigned DJ, Emcee multiple times throughout the planning process, and you'll have until 5 days prior to your wedding day to make any changes inside of your online planning portal. Our online planning portal is not only ideal for selecting music for important moments, creating a timeline, making payments easily on the go, and entering in additional need-to-know information, but it's also the place where you and your DJ connect. You connect through not only emails, phone calls and meetings, but also through song selections, pronunciation of names of your bridal party, and talking about the reason you chose the song you did for the father/daughter or mother/son dance. This system helps us to fine tune the details of your day, so that even after your wedding day has passed, you'll look back and see only the good. You'll see an incredible experience, a night full of memorable moments, and we'll reflect on building another incredible relationship. The online planning system might not seem like all that from the outside looking in, but when you realize how many incredible elements grow from our exclusively provided online resource, it suddenly becomes so much more. To learn more about our online planning system, confirm availability on your date, or just to chat about our services for your upcoming wedding day or special event over coffee, please contact us today!